The FBI added the suspect in last week's deadly ambush at a Pennsylvania State Police barracks to its Ten Most Wanted Fugitives list Thursday. "We now have made the world where he could hide a very, very small place," FBI Special Agent Edward Hanko, who's in charge of the bureau's Philadelphia field office, told reporters. 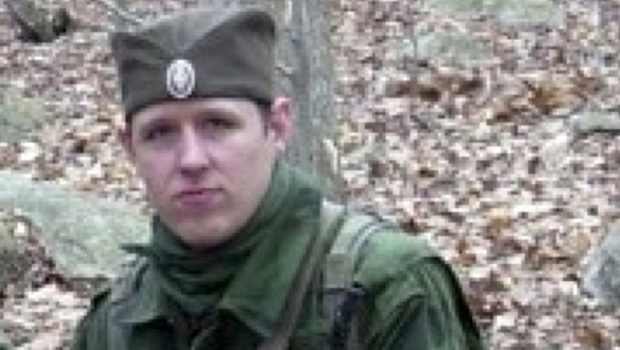 Authorities have been searching for Eric Frein, 31, for nearly a week after two state troopers were attacked just before midnight Friday in front of their barracks in Blooming Grove just as a shift changed. He allegedly shot and killed Cpl. Bryon Dickson and seriously wounded Trooper Alex Douglass. "We think he's on his own," state police Commissioner Frank Noonan told reporters. "Of course, we're not sure, but that's the way we're looking right now." With Frein's addition to the wanted list Thursday, the FBI will be offering a reward of up to $100,000 for information leading to his arrest. Hanko told reporters that Frein's description would be broadcast on electronic billboards up and down the East Coast. The police describe Frein as a self-trained survivalist with a grudge against law enforcement who has talked about committing mass murder. Frein grew up in Canadensis, Pennsylvania, a little crossroads town that has seen better days, CBS News correspondent Don Dahler reports. Roger Smith owns the local sporting goods store. He told Dahler that a few months ago Frein had a strange reaction when police cars passed by. "He said, 'I have to disappear,' and I says, 'Why is that?'" Smith said. "He says, 'Me and those guys don't get along.'" Police said Frein shaved his head in a Mohawk style as "mental preparation" for the attack. Two days after the shootings, Frein's car was discovered partially submerged in a pond two miles from the barracks. Officers say they found evidence in it linking him to the ambush, including shell casings and his driver's license. Hundreds of officers are looking for him in a heavily wooded area of Pennsylvania. Searchers have to make their way through rugged terrain with thick underbrush and hills. Frein is said to be very familiar with these woods. He is believed to be armed with an AK-47 as well as a .308-caliber hunting rifle with a scope. The son of a retired Army major, Frein was a member of a group who dressed up in Eastern European military garb and played war games. In 2007, Frein also played a German soldier in a short independent film. His father described him as an expert marksman who can't miss. Frein was described on his wanted poster as "known to be a heavy smoker," who "claims to have fought with the Serbians in Africa" and "has studied Russian and Serbian languages." Frein is the 503rd person to be placed on the Ten Most Wanted list, replacing former fugitive Jose Manuel Garcia Guevara, who was captured in July.